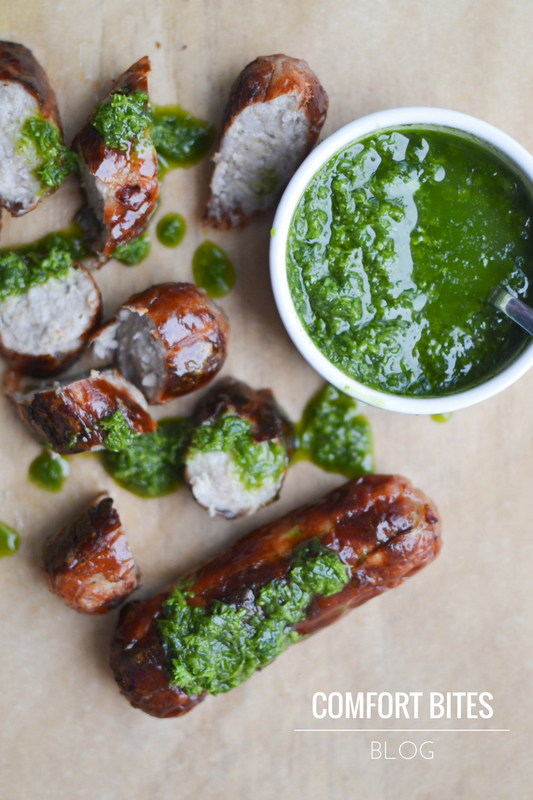 A beautiful bright chimichurri salsa, with a mild flavour, thanks to seasonal wild garlic. Great with grilled meats, roasted veggies, fish and sausages. Really great with sausages. This post contains some affiliate links. This means that if you decide to click on them and make a purchase, I might receive, at no extra cost to you, a small commission that helps me keep the blog going. Thank you for your support. 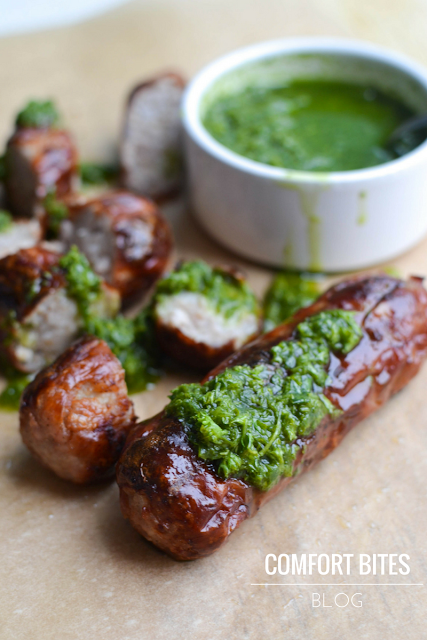 I've talked before about how I keep messing about with chimichurri, and my husband, who is from Argentina, rolls his eyes at me. I've made minty chimichurri (coming soon on the blog), rocket chimichurri (in my ebook SPICE) and mustard chimichurri. I just can't help it. And chimichurri's all good, but I'm watching my FODMAPs lately, and all that chopped raw garlic is a bit pungent. I always passed along the little tub of greenery at dinner and just ate my meat plain. Until I managed to get hold of some wild garlic, which is quite a bit different to fresh garlic. It's basically long, thin green leaves that look a bit like wide grass, but it smells like a cross between garlic and chives. It's heavenly, and this summer I've eaten it quite a lot. I've had a look at the FODMAPs in wild garlic, and although it's to be used with caution, some people tolerate it much better than the raw garlic bulbs. I do. I know that I can eat a spoonful or three of this and be fine. FODMAP intolerance though is obviously quite an individual thing so go with what you know about yourself. I hope you love it too. Place all the ingredients into a powerful blender or food processor and blitz until fairly smooth. Have a little taste and adjust the seasoning if you need to. Pour into a serving dish or ramekin and serve. This is also good the next day if you have leftovers - the liquids might separate, so just give it a stir before serving. Optional: you can also add quarter of a teaspoon of pimentón to the chimichurri if you like but this isn't AIP compliant so don't do this if you're sensitive to nightshades or if you're strict AIP.